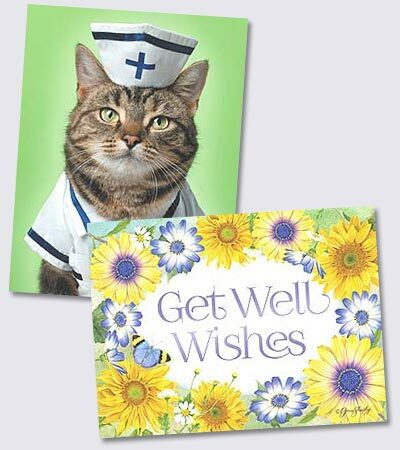 Get Well Cards filled with warm "feel better soon" wishes let them know you care! Send warm get-well wishes to friends and loved ones feeling under the weather. Let them know they are in your thoughts and prayers with thoughtful and encouraging Get Well Cards, or send a funny get well card for times when "laughter is the best medicine!" Also see our collection of Encouragement Cards that let you show loved ones your love and support during difficult times. Looking for the right "get well soon" messages, wishes and quotes? Browse our suggestions for What to write in a Get Well Card!